This past Saturday, June 23rd Blackstone Valley Community Health Care of Pawtucket, Rhode Island hosted children from surrounding community organizations such as Hockymock YMCA and Boy’s Town New England, among others, to attend a private baseball skills session. The theme of the day was ‘Get Active’ as BVCHC has joined in the fight against the epidemic of childhood obesity in the United States. On the 23rd the children were greeted at McCoy Stadium with complimentary PawSox t-shirts commemorating that day and were soon ushered onto the field where PawSox players greeted and took them through stations that worked on pitching, fielding, and hitting skills. Pitcher Alex Wilson took up in the visitor’s bullpen to teach the basics on different pitch grips and wind-up mechanics. Infielder Tony Thomas went over some basic batting stances and how to “squish the bug” with your back foot and use the core for a powerful swing. Finally infielder Jon Hee took out a fungo bat, hit the participants some grounders and reminded everyone to look the ball all the way into their gloves. Blackstone Valley Community Health Care was inspired by First Lady Michelle Obama’s ‘Let’s Move’ campaign that has similar interests in raising a generation of healthy kids. You can find more information about this movement at www.letsmove.gov. Please also visit Blackstone Valley Community Health Care’s website www.blackstonechc.org. 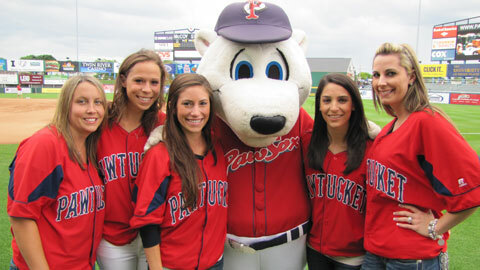 The Pawtucket Red Sox Wives are having a Food Drive on Monday, July 16. Bring 2 boxes of pasta to the game and receive an Autograph Action Photo of a PawSox Player. For more information, call (401)724-7300. The award is given for distinguished service by a non-registered Boy Scouts supporter. Lexington Legends Box Office Manager recently was presented the Boy Scouts of America North Star Award from the Blue Grass Council BSA. LEXINGTON, KY – On Saturday, June 16 the Blue Grass Council of the Boy Scouts of America presented David Barry, the Lexington Legends Box Office Manager, with the North Star Award. The North Star Award is a high-level award presented by councils on the behalf of the National Court of Honor for non-registered volunteers who have made a significant contribution to Scouting. This is the first time the North Star Award has been presented by the Blue Grass Council to a local citizen. David has been a member of the Lexington Legends Front Office staff since 2003 working in various positions within the Legends Box Office. David has been the main contact for the Blue Grass Council of the Boy Scouts of America and has organized the highly popular Boy Scout Campouts at Whitaker Bank Ballpark since 2005. David has also helped raise funds for the Friends of Scouting campaign and coordinated various Big L appearances at camps and other events. “David has been a valuable member of the Legends team for almost a decade now, and as evident by this award his great work extends far beyond Whitaker Bank Ballpark. All Legends staff members are encouraged to be active participants in our community and with causes that are important to them. 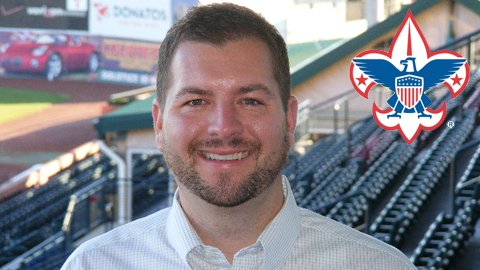 No one exemplifies that any more than David, and we’re thrilled for him to receive the North Star Award.” Seth Poteat, General Manager of the Lexington Legends. David is an avid outdoorsman and was with Troop 71 in Middletown, KY from 1990 to 1997, earning the Eagle Scout Award in 1997. To learn more about the Blue Grass Council of the Boy Scouts of America, visit their website at www.bgbsa.org/. To learn more about the North Star Award, visit the Boy Scouts of America website at http://www.scouting.org/scoutsource/Awards_Central/NorthStar.aspx. The Drive will wear blue jerseys and wrist bands during the game. Hey Drive fans – Loving your colon could save your life! Find out how at the “Drive Out Colon Cancer” game sponsored by BlueCross BlueShield of South Carolina on June 24 at 4:05 p.m. Hear live interviews with colon cancer experts, visit an “Ask-a-doctor” station, meet colon cancer survivors, sign a pledge card to get screened and register to win a great prize! Colon cancer is the second-leading cause of cancer death in South Carolina and nationally. But it doesn’t have to be. Colon cancer is one of the few cancers that can be prevented through regular screening. Screening allows doctors to remove polyps – precancerous growths on the inside lining of the colon – before they become cancerous. Screening should begin at age 50, or earlier if you have a family history of colon cancer or other risk factors. Stop by to learn how to prevent colon cancer and hit a home run for a healthy life! For more information on our statewide efforts to wipe out colon cancer, visit www.loveyourcolon.org. To purchase tickets to Sunday’s game, simply call the Fluor Field Box Office at (864) 240-4528 or log onto GreenvilleDrive.com. In an effort to raise awareness about the Princeton Rays, as well as reach out to the region’s children and parents, P-Rays’ staff members have been spotted in many area youth ballparks this spring. The team has been doing this annually each spring since 2007 to promote the beginning of the season as a part of their annual Little League Caravan. The 2011 version of the caravan concluded with stops that included Narrows, VA on June 6, along Baileysville, WV and Alderson, WV on June 9. With the 2012 season almost underway, the recent stops have reminded fans that a fresh, new outcropping of players are set to come to Princeton for another great year of baseball in the city. The Little League caravans are put in place to inspire the area’s young players to pursue the sport of baseball and continue their journey through the amateur ranks. Seeing the Rays personnel and receiving memorabilia adds excitement to an otherwise already enjoyable day of playing baseball. “The kids get inspired when they see the Rays,” said Baileysville Little League parent Brandon Hall. Alderson Little League player Bryson Ormsbee said he wanted to suit up for the Rays one day. “Yes [I would],” said Ormsbee. “And I want to play first base.” He listed his favorite player as Yankees Shortstop Derek Jeter. Covering communities in all directions and youth leagues of all ages, the Rays also promoted their annual youth baseball camp that has been a mainstay for young ballplayers for sixteen years. The camp allows Little Leaguers ages 7 to 15 to interact with the Princeton Rays players, while gaining valuable baseball instruction in the process. It takes place on Saturday, July 28 from 9:30 A.M.- 1:00 P.M.
A long-time favorite, the 16th annual Princeton Rays Youth Baseball Clinic will be held from 9:30 a.m. to 1:00 p.m. on Saturday, July 28, 2012 at Hunnicutt Field in Princeton, WV, home of the Princeton Rays. The clinic is open to boys and girls ages 7 to 15. Instructors for the clinic will be 2012 P-Rays’ manager Michael Johns, his coaching staff, and several P-Rays’ players. Kids will be instructed in all facets of baseball and an autograph session will follow the clinic. 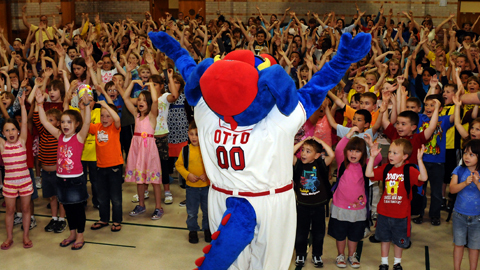 Each attendee will receive a clinic tee-shirt and free admission to the P-Rays’ home game that evening (July 28) versus the Bluefield Blue Jays. Fee for the clinic is $30.00 per participant and all participants registered and paid in full by July 18, 2012 will receive their shirts on the day of the clinic. The clinic has had the same two corporate sponsors for the entire 16 years, Newberry Ford, and The Lewis Agency of Princeton. Even now, kids can already register for the clinic. Persons needing more information on the clinic or wanting to request a registration form are asked to contact the P-Rays’ front office either by e-mail at princetonrays@frontier.com or by telephone at (304) 487-2000. The Princeton Rays are the Appalachian League minor league baseball affiliate of the Tampa Bay Rays. This article originally appeared on the official website of the the Princeton Rays. Click here to view the original story. 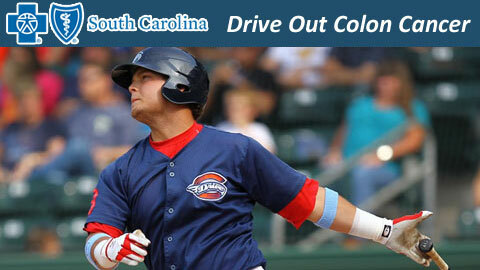 Receive a complimentary t-shirt and tickets to the Drive’s June 24th game. The Drive and The Blood Connection are teaming up to help save lives this Friday, June 8th. 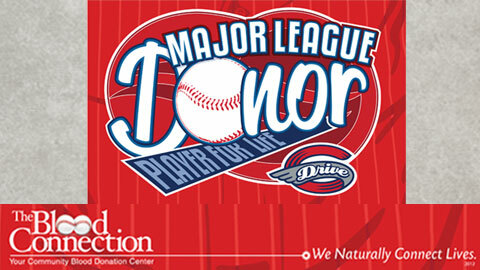 Be a “Major League Donor” by donating blood from 11 AM to 7 PM at one of eight locations, including Fluor Field. Each donor will receive a complimentary t-shirt and two tickets to the Drive’s Sunday, June 24th game versus the Charleston RiverDogs. Those donating at Fluor Field will also receive a complimentary hot dog, bag of chips, and 12 ounce Pepsi product. While first pitch for that game is at 4 PM, donoros will receive early admittance to the ballpark for the “Donor Appreciation Day” event from 1 PM to 3 PM. The Donor Appreciation event will feature complimentary hot dogs, chips and drinks, clowns, balloonists, face painters, inflatable games, and activities for kids. 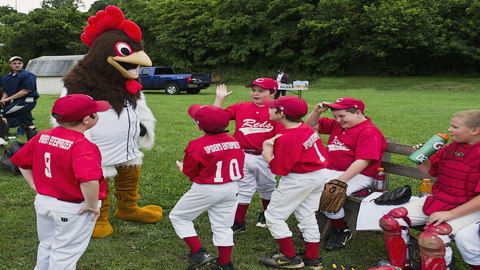 Fans can even meet Drive players, and their lovable mascot, Reedy Rip’It from 2 PM to 3 PM. Those wishing to donate during Friday’s Blood Drive must be at least 16 years of age. During the team’s last homestand, starting pitcher Matt Shoemaker made a visit to the in-patient wing of Shriners Hospital for Children – Salt Lake City. 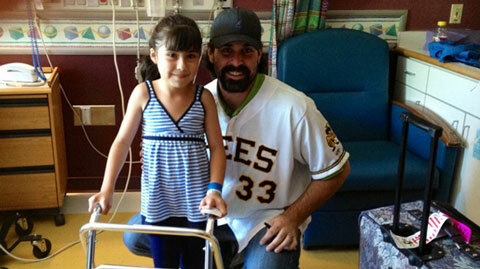 Shoemaker went room-to-room, spending time with patients and their families. He also took photos and signed autographs for the children. “It was fun to see the kids smile and be able to interact with them,” said Shoemaker. Shriners Hospitals for Children® – Salt Lake City provides state-of-the-art medical care in a family-centered environment. The colorful, light-filled hospital is designed to let children with a host of orthopaedic and neuromusculoskeletal disorders learn new skills, make friends and receive care in a safe, supportive and high-tech setting. Every staff member – from surgeons to therapists, nurses to orthotists – is dedicated to helping children achieve their best quality of life.